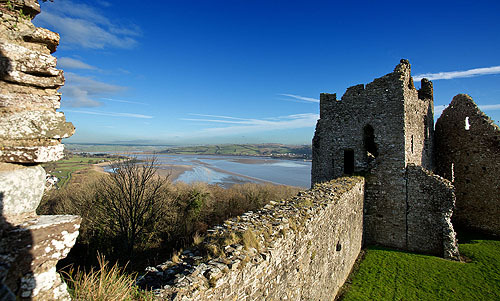 Fine views from Llansteffan Castle over the Towy estuary and Ferryside on the opposite bank . The tide in the estuary means that the sands are quickly covered . At low tide Llansteffan has a long sandy beach that stretches round to Scott's Bay and Wharley Point where the estuaries of the Towy and Taf meet.